Welcome to the only marketplace built by Blender users to support the Blender commnity, Blender artists and Blender development. Earn up to 95% of each sale while having the option to donate a portion of your proceeds to the Blender Development Fund. It's more than an approval process, a member of the Blender Market crew will download your item, test it, and ensure it is ready for the spotlight. Wish you could email your customers directly? 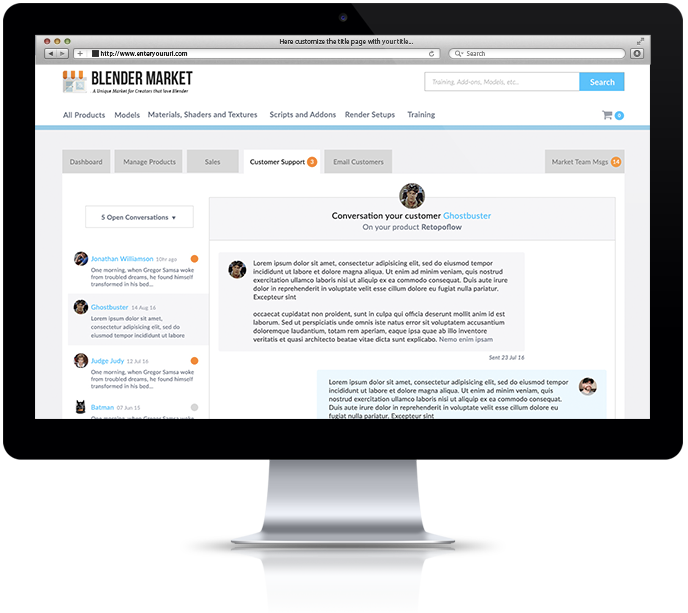 With the Blender Market customer messaging feature you can reach all of your customers straight from your Creator Dashboard. Don't get stuck in a silo, ping ideas and collaborate with other creators on the market in this private Slack channel for Creators only! Creating a product is only the first step, keeping customers happy through great support is essential to building a sustainable business. 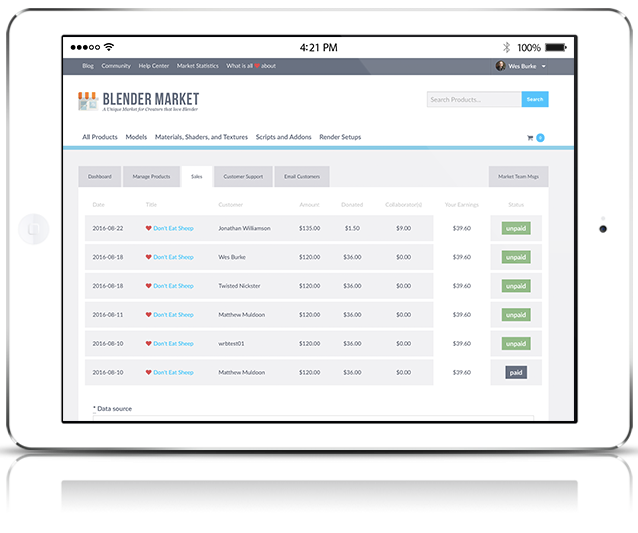 On the Blender Market you can reach customers any time and they can reach you, right through a direct messaging system for easy product support. A happy customer is a repeat customer. Blender Market has made it easy for me to share and earn money with the very addons I create for myself, it is integrated on our community, that is follows the rules of Blender project so we developers don’t have to worry about it. Blender Market is really a very important part for our success as 3D artists and community. The Blender Market is fantastic! Not only did it open up a form of income for people in the Blender community, but it also made things possible to create. I think many can agree with me that a lot of the addons, models and assets would not exist if it wasn't for The Blender Market. I love the Blender Market. The add-ons are well made and highly affordable. And they're constantly adding new items, which seem to be what I need when I need it. Earn up to 95% commission on each sale, no strings. See pricing and commission rates on the Pricing page.